While actually dairy-free and vegan, no one will know the difference from your regular recipe! And perhaps a little healthier than those made with heavy cream and real butter, this version allows reduced guilt seconds... and thirds. Line a baking dish with foil or waxed paper, allowing the foil or waxed paper to hang over the sides for easy removal (my pan is 6 x 8 in size). Spray with a small amount of cooking spray. Set aside. In a saucepan over low heat, melt the butter alternative (or real butter if your prefer). When melted, add the remaining ingredients. Whisk until smooth, then quickly pour the batter into the prepared pan. Chill for a few hours. 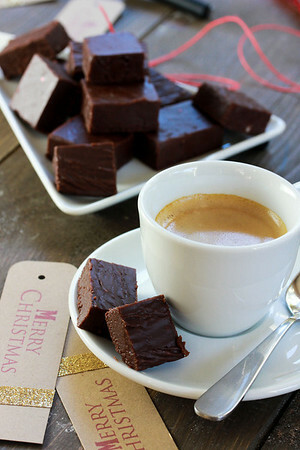 Remove pan from fridge, then pulling on the sides of the foil or waxed paper, pull the fudge from the pan. 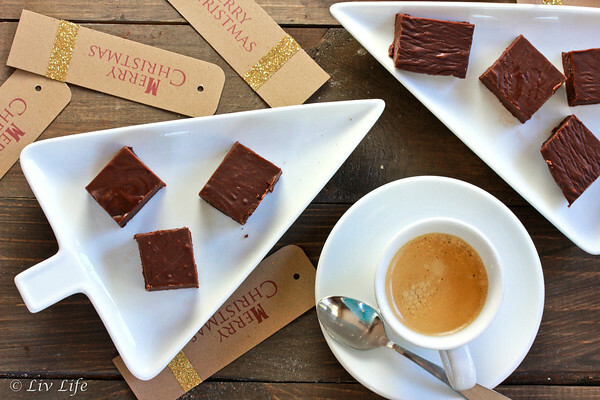 Carefully peel the foil or waxed paper from the fudge, then cut into small pieces, or alternatively, use a cookie cutter to make shapes. Liv Life Note: For sharp, clean cuts, run your sharp knife under hot water, then dry with a paper towel. Cut, then clean with the paper towel after each cut. Re-warm the knife as needed. Thanks Happy Valley Chow!! We are making our second batch in 24 hours today...!! Such a sweet mama! But I already knew that. 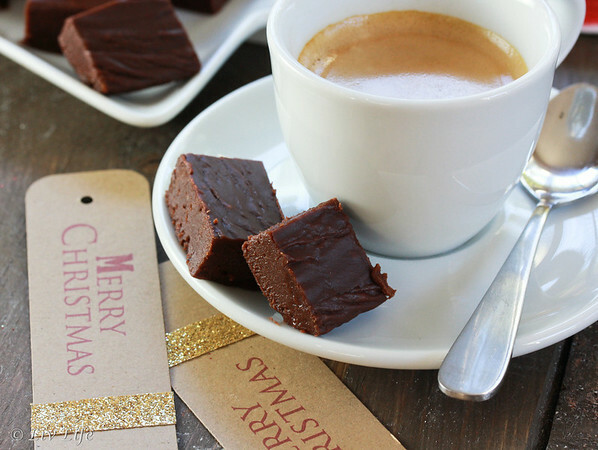 :-) I am sure he appreciated both the fudge and the effort you put into making this recipe. Merry Christmas my friend! I hope you get to enjoy your family this Christmas! Would this work with coconut milk? I prefer the taste of coconut milk so always have that on hand over almond. I have everything on hand and could make this and feed my brother to prove non-dairy is tasty. 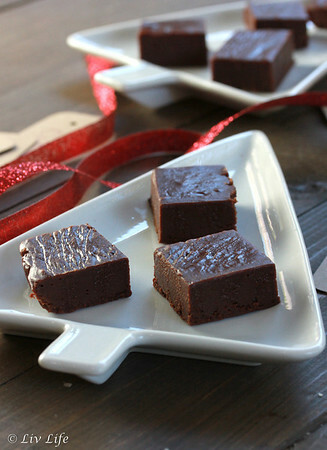 I'd never think to make dairy-free fudge - what a treat! Merry Christmas and Happy Holidays to you and your family Kim! At this point in our gluttonous holiday extravaganza I hope I don't see another piece of fudge until December 2104. And, when I do, I hope it is this recipe. :) Happy holidays! Hope you had a lovely Christmas Kim. You're such a good mom, I know your son love this fudge that you made specially for him. Wishing you a blessed and happy New Year.